As a man who has eaten his fair share of Reeses Peanut Butter Cups blizzards, I can say this with much conviction: Friendly's take on this classic is simply fantastic. Friendly's has long been the stronghold of a good sundae ever since I came to New England. No, I don't go once a week, but I know that whatever dessert item I pick, it's gonna be good. Well, they've taken your standard soft serve and peanut butter cups mix and brought their sundae specialty skills to the table. Rather then blend a ton of pb cups up to give a nice uniform pb cup taste, they've taken a few cups and then poured in some good fudge sauce and their most excellent pb sauce. I was hooked from the first bite. I think there is a trade off because you need to blend the treat enough to spread out the pb cups, but then if you blend too much, the pb sauce gets obliterated. 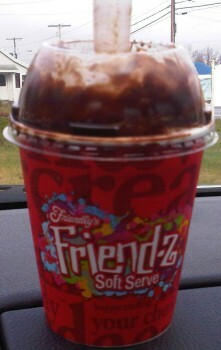 So, with Friendly's you wind up with excellent pb flavor, but don't expect a ton of small chunks. Still, with that said, man this was good and totally hit the spot today. FYI: I finally realized what those giant boxy spoons are for! I feel dumb for never noticing that the spoon is also the stirrer on the machine. Helps keep mess down. Very smart. I prefer more cups and no sauce.